Operation Fed Up net multiple drug arrests in Houma. NEW ORLEANS (WVUE) -An investigation in Houma has resulted in multiple drug arrests. 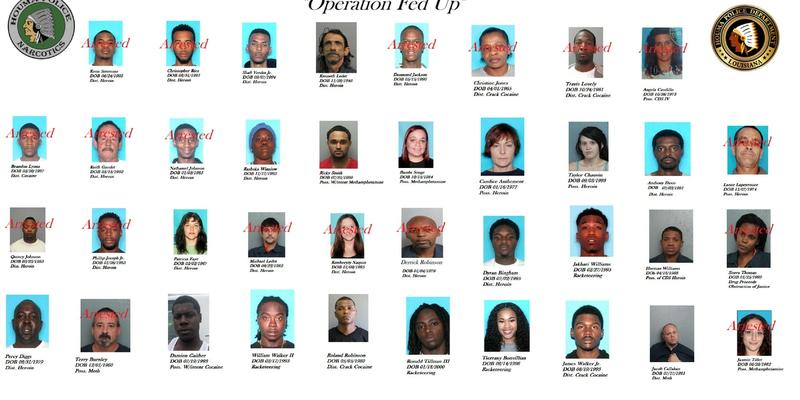 Over the past several months, Houma Police, Louisiana State Police,Terrebonne Parish Sheriff’s Office, and the Thibodaux Police Department conducted “Operation Fed Up" to address the illegal sale of narcotics throughout the city limits of Houma. According to Houma Police, on Wednesday morning the agencies apprehended multiple suspects on warrants related to the distribution and possession of heroin, cocaine, methamphetamine, and other narcotics. Police say the operation was named “Fed Up” because of the continuous issues surrounding the opiod epidemic in communities across the nation. Houma Police said the operation will continue as they attempt to rid neighborhoods of the issue. Anyone with information is encouraged to submit a tip anonymously through Crime Stoppers Bayou Region by phone at 1-800-743-7433 or online at www.crimestoppersbr.org. Tipsters could be eligible for a reward of up to $1,000 in cash if the information leads to an arrest.